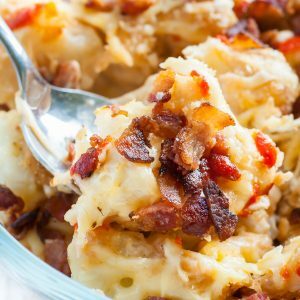 This Bacon Sriracha Cauliflower Gratin is a spotlight-worthy side that’s easy, cheesy, and insanely delicious! 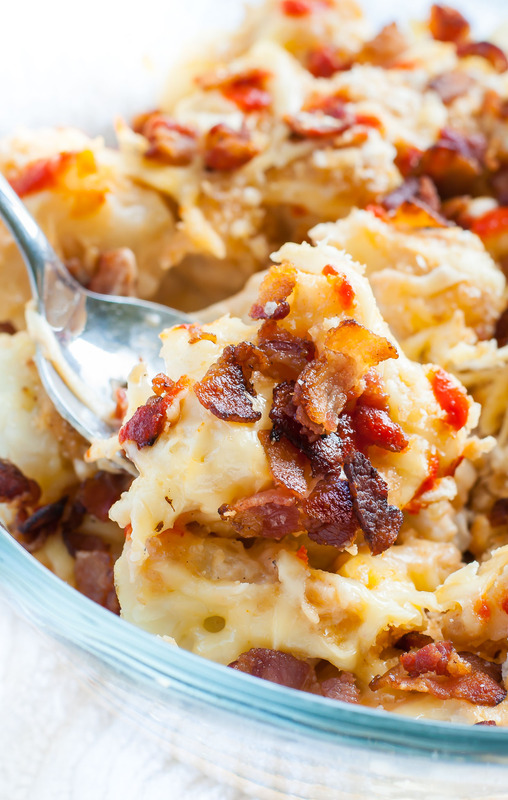 We love this cauliflower casserole! I promised myself I wouldn’t post this one until I had better photos to share along with the recipe… Then I promptly kicked myself in the face. Insecurity is so dumb sometimes, especially when it’s over something as trivial as photos for a knockout recipe. And this dish is a TOTAL knockout. It’s a warm hug on a cold day, a game changing side dish, and proof that cauliflower is so much more than a trendy substitute for white potatoes. When I decided to make a gratin-style casserole with my favorite foodie trifecta (Sriracha, bacon, and cheese, yo!) I literally had no other veggie in mind for the job. Cauliflower for president. I flipping LOVE cauliflower. It’s one of those foods that, though completely devoid in color, is positively bursting with nutrients. It’s a great source of vitamins and is oh so versatile. Whether you mash it, blend it, or transform it into pizza crust, cauliflower is your guy. He has your back. He… why on earth am I personalizing cauliflower? Now we’ll never be able to eat him… I mean it! Gahhhh you know what I mean! While I sit in the corner contemplating what I’ve just done, you should march your cauliflower-loving face in the kitchen and make this recipe. Not a fan of cauliflower? Fret not, that’s about to change! 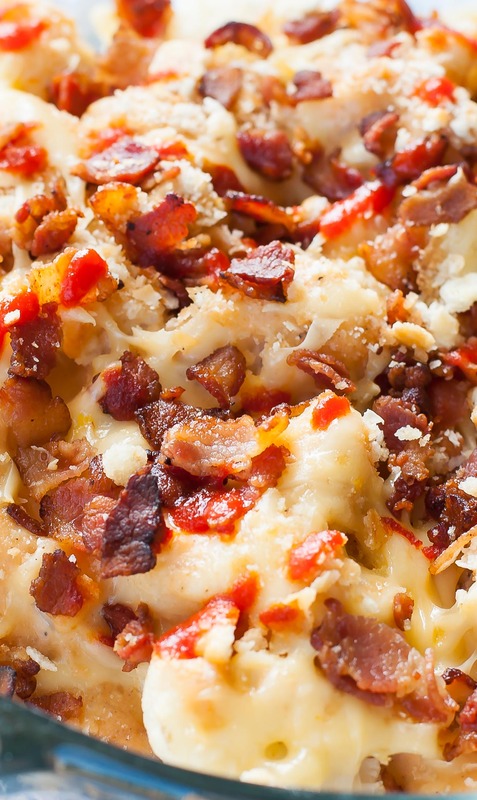 This easy, cheesy casserole is about to win you over. I could wax poetic about how ridiculously tasty it is for hours, but all that’s going to do is turn me into a hungry hungry hippo and delay you from making this dish. So let’s move on to the recipe, shall we? 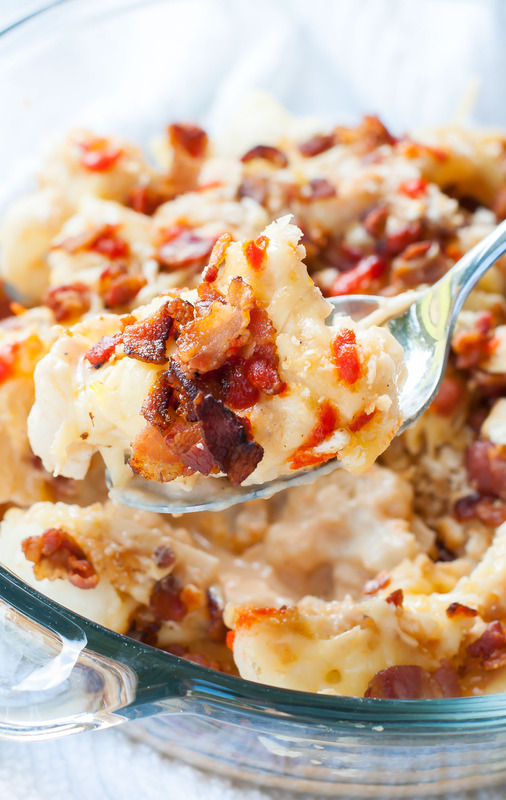 This Bacon Sriracha Cauliflower Gratin is a spotlight-worthy side that's easy, cheesy, and insanely delicious! Set aside a bowl of water and ice to shock your veggies post-blanching to keep them al-dente. For soft cauliflower you can skip this step. Cook the cauliflower florets in a pot of boiling water with a pinch of salt for about 5-7 minutes until tender. Drain and toss cauliflower into the ice bath to halt the cooking process and keep the cauliflower's integrity. We want tender, al-dente cauliflower - no mushy veggies here! Though you can absolutely adjust the texture to your liking. While it chills, start your sauce. Melt butter in a saucepan over medium-low heat and add your minced garlic. Add flour, slowly, whisking constantly to create your roux. Pour warmed or room temperature milk/cream into the butter mixture and whisk constantly until thickened. Remove from heat and add salt nutmeg, and 1/3 cup grated Gouda cheese. Stir until the cheese melts into the sauce and add your Sriracha. Remove your cauliflower from the ice bath with a slotted spoon and move it to a baking dish. Pour the sauce over your cauliflower and toss to coat. 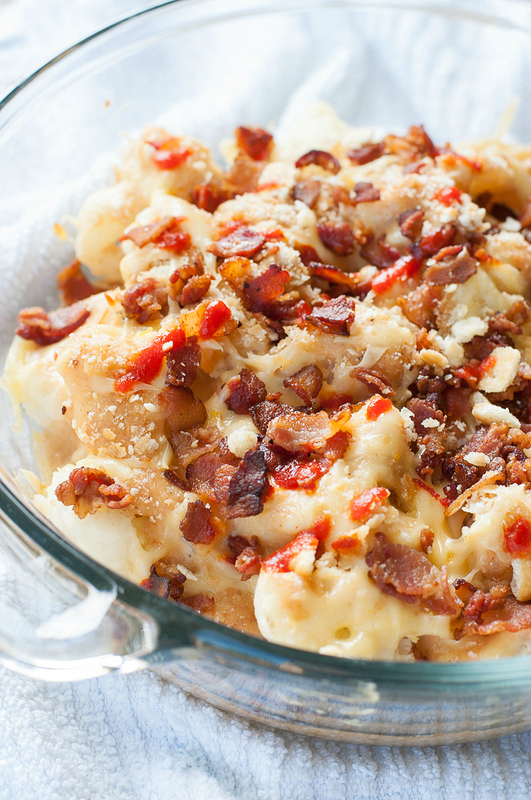 Top with additional cheese, bacon, and crushed crackers or bread crumbs. Bake at 350 degrees F for 20-30 minutes until golden and bubbly. Top with an additional drizzle of sriracha and dive in! I almost can’t handle how good this is. I have a soft spot for easy-yet-indulgent comfort food and this dish fits the bill. Try it! Bacon Sriracha Cauliflower au Gratin FTW! hungry for more sassy sides? My company is having a pot luck lunch, and I would like to bring this dish. We do not have an oven there. Can I make this in a crockpot? Or make it in the oven as directed, and transfer to a crockpot to warm it? Jenn, this sounds amazeballs!! I have GOT to give it a try ASAP!! This looks amazing and I have it bookmarked. The bacon really puts an awesome finishing touch to this dish and reading some of the other comments, I see that you also have a brussels sprouts gratin? I am so there!! I HATE cauliflower with a passion. I try every recipe I see hoping I will find one I can tolerate. I made this today & fell in love! This was one of the most delicious side dishes I have ever tasted. Thank you so much for giving me a new go to recipe & helping enjoy such a nutritious veggie. hey, great recipe! How many does this serve and do You serve it in a casserole dish? Finally made this today and it was delicious! Yay!!!! Excuse me while I break out into a happy dance! 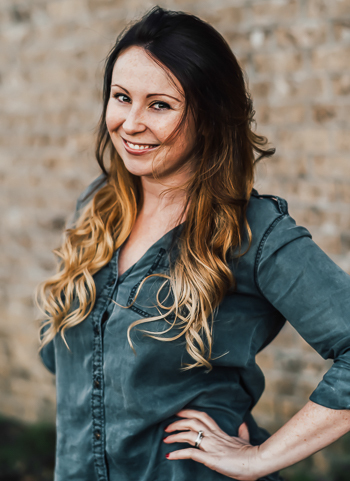 😉 Thanks Kristin! Holy yum! I’m mad that I missed seeing this recipe for 4 days. Cauliflower IS underrated. I love how versatile it is; it’s one of my favorite go-to veggies! I know the bacon-loving hubby would ADORE this recipe. Oh wow! This looks incredible! Pinning! This sounds absolutely delicious.You had me at “add the bacon grease back in…” yes. please. or no.I am not sure that I should, but I think I love this! Where does the garllic fit in? Hey Sharon! Saute it with the butter before adding your flour – hope you get a chance to try it! It’s on the menu again for us this week! Alternatively I’ve also made it without the garlic and used a little garlic powder and it still came out marvelous! Thanks for amending the recipe. I minced it up, but didn’t know what I was supposed to do with it. My husband still doesn’t like cauliflower, but *did* like the sauce and thought we should try it on broccoli. Yay!!! Hope you adore it Betty! you are just unreal. Like seriously! can i move in? I need this in my life. This looks delicious. I love cauliflower cheese with whole wheat spaghetti, but bacon and sriracha? That will take it to the next level. Thanks! Bacon and Sriracha are so next level together – thanks Esther!! This is definitely on my to-make list. But…where do the brussel sprouts come in? I don’t see them in the pic and they are not mentioned in the ingredient list.